NOW ON SALE FOR $10.99!! (list $14.95) First book in the Manhunter series. Matthew Blue wanted to stay home, raise horses and be a good husband and father. When a runaway slave living with the Comanche is accused of kidnapping the Hancock baby, he is once again called on to become Manhunter. Leonida Garcia has been beaten, robbed, widowed, and seen enough trouble in her young life to last ten lifetimes. Now she wants nothing more than to live peaceably on her rancho. 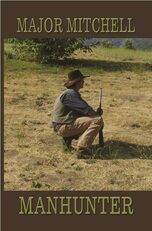 But when someone murders Ambrose Brice, she encourages retired ranger and friend Josiah Russell to find the killer. Bill Mayfield had talked his younger brother, Rob, into selling the family farm after their mother died with a promise that they would leave Texas. Rob didn't realize that his brother had different ideas about life, some not so healthy. 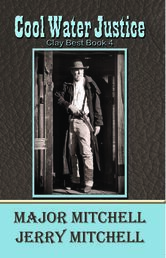 Clay Best was sick of being a low-paid, over-worked lawman. He wanted a small spread somewhere where he could raise a few head of cattle. Instead, he found himself involved in chasing bank robbers and trying to rescue a beautiful hostage. Clay Best had agreed to take Teresa into Mexico and get the gold Refugio had hidden. He talked Julio Garcia into going, but it was quickly turning into a journey where Julio’s gun might not be enough. Katherine Parker had been losing cattle and she wanted it stopped, but the fight had become personal the day she hired Phillip Denning. Now, Pox wanted more than her cattle. He wanted Katherine and her sons dead. Chris came to California to forget about the war. What he found was a pregnant woman and her nine year-old son abandoned on a place called Poverty Flat. Margie loved horses and rodeo more than life itself. She knew, given the chance, she could out-ride most men. Set in modern day Oakdale, California. Charlie wants to be a member of the pack more than anything. But he will have to dig a hole under the fence to join the other dogs, which is something Bob, his human, doesn't want him to do. And being a member also means he would have to turn his back on his best friend, Samantha, because being friends with a cat is something the pack doesn't think a dog should do. A series of stories about a young girl in various life adventures with a Christian perspective.